Sgt. 1st Class Bonifacio Castro II didn’t think it was necessary, but Army commanders told him otherwise: He needed a break from the infantry. In nine years with the 173rd Airborne Brigade Combat Team in Italy, he deployed to Iraq once and Af­ghani­stan three times. The personal losses mounted with each deployment. The losses also included his younger brother, Sgt. Jesse J.J. Castro, 22, a Schofield Barracks soldier who was killed in Hawi­jah, Iraq, in 2006 when a roadside bomb exploded. Under rainy skies, his voice wavering with emotion, Castro spoke Friday to several hundred soldiers and officials at the outdoor dedication of a new $60 million Warrior Transition Battalion campus at Schofield, including a barracks for 120 soldiers. But Castro said there is hope — and support from family and friends. In 2012, at the urging of his command, he was transferred to the Warrior Transition Battalion at Schofield to serve on its staff. The Warrior Transition Battalion was created to provide personal support to ailing soldiers who require at least six months of rehabilitative care and complex medical management. The battalion closely resembles a “line” unit with a chain of command, the Army said. Each soldier in transition works with a primary care manager (normally a doctor), nurse care manager, social worker and squad leader who coordinate care. Warrior Transition Units were started in 2007 with the goal of improving care as the Iraq War raged. Other units could transfer out a soldier in need of serious medical care to a WTU and receive another to take his or her place. With the end of the Iraq War in 2011 and U.S. involvement in Af­ghani­stan diminishing, the Army is changing its medical care structure for wounded, ill and injured soldiers. While the transition command had the capacity to treat 12,000 soldiers worldwide, the population had dropped to 7,070 in 2012, the Army said. A year ago the Army attempted to downsize the Schofield program from a battalion to a company with a planned reduction in staff. That didn’t fly with some members of Congress, including U.S. Rep. Tulsi Gabbard, an Iraq War veteran, as well as U.S. Rep. Colleen Hana­busa, a member of the House Armed Services Committee. Gabbard and U.S. Sen. Mazie Hirono attended Friday’s dedication. “There was some concern at that time that this unit would be downsized, and that’s where my concern was — to try and pre-empt that from happening, understanding the need for it and that, sadly, we have more troops who need this kind of place, this kind of home,” Gabbard said after the ceremony. A total of 281 soldiers were in the program last November. There are 215 in it now, the Army said. In January the Army announced it was closing five WTUs on the mainland with fewer than 38 soldiers then assigned to each. About 40 individuals in the Schofield program in January were Guam Army National Guard soldiers coming off a deployment to Af­ghani­stan, the Army said. Fewer than 15 remain in the program from the deployment, but other Guam soldiers have taken their place, according to the transition battalion. 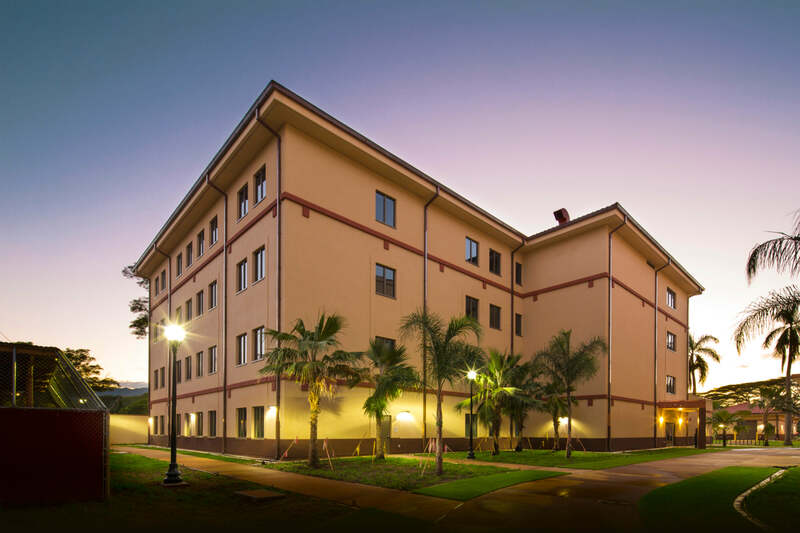 A four-story administrative building and five-story barracks now bring together functions that were previously spread out at Scho­field. “Being centrally located now has increased tremendously the efficiency of our operation,” said Lt. Col. Brian Peterson, the transition battalion commander. With war deployments dropping, meanwhile, the patient demo­graph­ics are changing. For 2014 fewer than 20 percent of soldiers in transition had a diagnosis of post-traumatic stress disorder, the Army said. The majority of patients are headed for medical discharge, officials said. That’s the case with 1st Lt. Matt Turull, 30, who has been in the transition battalion for about eight months after he said he shattered his left leg and had three surgeries on it.